Cable companies can deliver very fast broadband service because the coaxial cable they use offers so much more bandwidth than the twisted-pair cable that DSL service relies on. And the cable companies will happily rent you the equipment you need, on top of the fee they charge you for internet service. But they can’t force you to use their equipment, so router manufacturers are building cable modems you can purchase. Linksys jumped into that market today with its CG7500, a two-in-one DOCSIS 3.0 cable modem/router. The Linksys CG7500 DOCSIS 3.0 cable modem features a built-in 802.11ac Wi-Fi router. DOCSIS (Data Over Cable Service Interface Specification) is the standard that enables existing cable-TV systems to carry data in addition to TV programming. Being a DOCSIS 3.0 device, Linksys says its CG7500 is compatible with broadband packages offering download speeds up to 300Mbps. If your cable company is delivering faster speeds, you’ll want to look at a modem based on the newer DOCSIS 3.1 standard. The Xfinity xFi cable modem that Comcast announced earlier this week, for example, is a DOCSIS 3.1 device that can accommodate broadband service with download speeds of up to 1Gbps. The Linksys CG7500 also incorporates a dual-band AC1900 Wi-Fi router in the same enclosure to deliver throughput up to 600Mbps on the 2.4GHz frequency band and 1,300Mbps on the 5GHz band. The gateway has a four-port gigabit switch and a USB 2.0 port. Linksys says its cable modem is priced at $199.97 and is available now. Based on a rental fee of $10 per month, it should pay for itself in about 20 months. Linksys is also filling in the middle of its Max-Stream series of tri-band routers: The $300 EA9300 is an AC4000 model that is now bookended by the entry-level EA8300 (an AC2200 model that sells for $200) and the high-end EA9500 (an AC5400 model that sells for $400). All three models operate one wireless network on the 2.4GHz frequency band and two independent networks on the 5GHz band, with an auto-steering feature that automatically assigns 5GHz clients to the most appropriate network to balance the router’s load. They also support multi-user MIMO (MU-MIMO, a technology we explain in depth in this story). 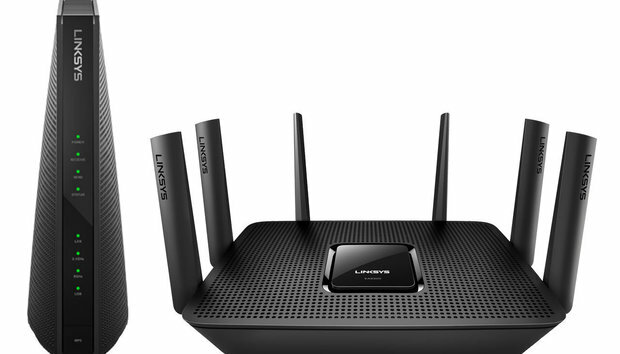 The new Linksys EA9300 is a mid-range tri-band Wi-Fi router that retails for $299.99. The EA9300 delivers wireless throughput of up to 750Mbs on the 2.4GHz band, up to 1,625Mbps on the lower channels in the 5GHz frequency band, and up to 1,625Mbps on the upper 5GHz channels. A “seamless roaming” feature offers mesh-like performance when the router is deployed alongside a Linksys RE7000 range extender: The router and the range extender use the same SSID and client devices are automatically passed back and forth without any connectivity interruptions. Linksys promises that an upcoming firmware update will introduce several new features including “dual WAN,” which will aggregate the bandwidth of two broadband connections to provide internet bandwidth in excess of 1Gbps; link aggregation to support file-transfer speeds up to 2Gbps; and dynamic frequency selection, which will provide up to four times the wireless channels available on the 5GHz frequency band. Linksys says the EA9300 should be available now.